Italy Travel 101: How to Create a Family-Friendly Itinerary | Ciao Bambino! Ciao Bambino’s roots are in family-focused trip planning to Italy and family tours of Italy are still our requested service by a long shot. Incredible food, a rich culture that loves children, amazing sights — there’s a good reason why Italy is an all-time favorite destination for many travelers. 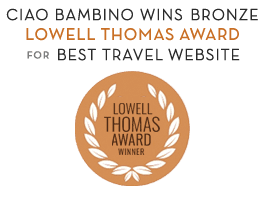 Ciao Bambino readers write us all the time asking for help constructing the best itinerary with kids in Italy for families who have a week or two to spend in the country. Given the time and culture change, families need a minimum of 10 days on the ground to travel successfully to Italy, particularly when coming from the United States. To be honest, we break this rule every year given our schedule constraints; it’s not impossible to travel for a week in Italy or even less, it simply makes the trip much tougher on everyone. Variety is important to maximize interest and engagement — I like to mix up city time with countryside and/or seaside time. The main Italian tourist cities can be brutally hot and crowded over the summer months when most families are vacationing. That said, cities are an essential part of experiencing Italian culture; rather than skipping them altogether, my recommendation is to experience them in small doses. A weeklong stay in the countryside is absolutely ideal with kids. Tuscany is the first rural region I recommend to families (Umbria is the second). Yes, Tuscany is touristy, but it is touristy for a reason — there is a long list of incredible things to see and do. The consequence of Tuscany’s popularity is that there is a wide array of accommodation options and services. This infrastructure is what makes travel with kids here work so well. Italy is a big place — make sure you look at a map and understand where you will start and finish the trip. When possible, I encourage people to go in one direction and structure flights accordingly, i.e. start in Rome and end in Venice, flying in and out of each city, respectively. The rumors are true, Rome is big, crowded, and hectic. There are also an insane number of awe-inspiring, historic sights to visit. Despite all the times I’ve been to Rome, I still haven’t seen many of the tourist attractions. Parents continually give me feedback that they are surprised at how much they enjoy Rome with their kids. The bottom line is that is that Rome is a fantastic place to start an Italy adventure. Inbound flights are plentiful and it’s relatively easy to enjoy the city without an intense schedule — part of the fun is simply walking around and exploring the neighborhoods. Meals and services are easy to find and you don’t need to worry about driving. Note that 4 nights is just enough time to recover from jet lag and see the main sights, nothing more. Most of the truly family-friendly accommodation options — those with a kitchen and private living space — have week-long minimum stay requirements from Saturday-to-Saturday in peak travel periods. It is best to book this part of your trip first and then work around it. The set up of many of theses properties in the countryside (see our article Family Travel in Tuscany – Agriturismo Living) make it easy to settle in and live like a local (they are under the ‘resorts’ category on Ciao Bambino). Ideal options have open spaces for kids to run around and a swimming pool. This means you can easily pair sightseeing with time hanging out and relaxing. What to see is the subject of another blog post, but suffice to say that there are an endless number of interesting options for kids of all ages. People have a love/hate relationship with Venice. Either they come back raving or they are miserable every minute they are there. In my book, it is a must-see city, particularly with school age kids and older (it is a bit of a challenge with babies and toddlers given all the steps and open water, but not impossible). If you have young children and want to opt out of Venice, there are many other options for an additional few days on the ground — Cinque Terre, Lucca, and Florence, to name a few. In a 10-day itinerary, visit a city for 2-3 days and spend the bulk of the time in the countryside per my outline above. The only exception is winter months when rural activities are more limited — in those cases (skiing is the exception), the itinerary can be reversed with more city time. Thank you for this post – I’d like to take the family (husband and now 8-yr old daughter) in 2011 and this give me a place to start. Great post! Italy really is a fantastic destination for families and I agree wholeheartedly that taking your time and slow travel is key. Stay longer ( at least 2 weeks) and do less to enjoy it more. We just spent a month in Italy and found Cinque Terre an ideal family location and a farm stay in Verona ( perfect place to take kids to the opera in the world’s 2nd biggest coliseum). See Romeo and Juliet’s home and read and watch the Shakespeare play while there! Little girls love having their picture taken on Juliet’s balcony & having a picnic on the marble seats of the famous Roman Arena while watching Carmen or Aida as the moon rises will be something they will never forget…and it only costs $25! We have been traveling the world as a family non stop since 2006 and I find Rome one of the worst places for families. I would spend much less time there. Nearby Pompei or Florence is much richer in history and so much easier on families. Rome is hot, crowded, overwhelming with a very bad reputation for theft. I’m not saying not to do it, but we have been to Italy 4 times as a family & spend the least time in Rome ( always in off season…when it still is packed). One source that most American’s miss out on are the wonderful luxury campground resorts in Italy ( and all over Europe) which all have nice rental apartments and cottages. It is also the best way to meet other European and Italian families as this is how most European families travel. My child has pen pals from around the world from wonderful friends she met this way! They have wonderful beaches, waterparks & everything you need, even free kids’s club activities for the kids, horseback riding, kids disco at night etc and winetasting for adults etc. You also save a bundle! American camping and European camping are 2 VERY different things. The VERY best place for families to stay in Venice ( as well as Chianti) is in one of the 5 star campgrounds. Wonderful beaches, water parks, playgrounds & a fun, fast ferry ride to Venice. Best of both worlds! genius article. thanks for all these great tips! You have definitely whetted my appetite for a family trip to Italy – can’t wait to start planning and scheming! Would like to do this itinerary, can I schedule accomodation and transport for the 3 cities before I go there? My mom was told children under the age of 8 are not allowed on tours in Italy. I appreciate your list of your guides who focus on children but my soon is only six months old so obviously going on a kid focused tour is not necessary; do the traditional tour companies really not allow children??? When is the best time to travel to Italy with kids. We were thinking of going in January with 3 children age range (4-11).